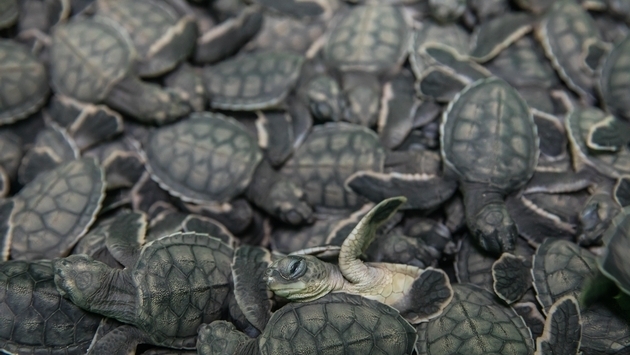 “The Sea Turtle Conservation Program of the Riviera Maya, headed up by Flora, Fauna y Cultura de México AC, environmental and social arm of Grupo Experiencias Xcaret, is recognized nationally and internationally for its uninterrupted work of 15 years, the quality of the work done, as well as being in charge of 13 of the main nesting beaches of the loggerhead sea turtle (Caretta caretta) and the green sea turtle (Chelonia mydas),” said Guadalupe Quintana Pali, General Manager of the organization. Commenting on the achievements of this conservation effort, Quintana Pali explained that from 1996 to 2017, just over 12 million, 649 thousand sea turtle hatchlings made their journey to the sea, a fact unprecedented in the history of the conservation of the species. which speaks of the consistency that has been made in this effort. The green turtle has recorded the best recovery of its populations throughout these 22 years of work. 2017 was, undoubtedly, the best year for the population of Chelonia mydas, as 1,507,645 hatchlings managed to reach the sea, which marks a new record after 2015 recorded the best figure in the history of the program. Flora, Fauna y Cultura de México A.C. protects sea turtles on the beaches of Solidaridad, Cozumel (Xel-Há), and Tulum, in four protected natural areas of Quintana Roo: Xcacel-Xcacelito Sea Turtle Sanctuary, Mexican Caribbean Biosphere Reserve, Tulum National Park and Sian Ka’an Biosphere Reserve. The protection of the 13 nesting beaches is carried out through five turtle camps: Aventuras-DIF, Xcacel, Xel-Há, Kanzul and Caahpechén. “Although the results are positive, it is necessary to continue the efforts on a permanent basis,” said Guadalupe Quintana. She said that the team in charge of this responsibility is composed of around 30 professional caregivers and more than 40 volunteers, and stated that in the task of conservation all support is important and welcome. In this regard, she recognized the support of Grupo Experiencias Xcaret, Hotel Nueva Vida de Ramiro, Grupo Posadas and Hotel Bahía Príncipe, mainly as allies and donors that have allowed this ambitious program to continue. Flora Fauna y Cultura de México A.C. is celebrating 15 years of work, seeding the future. It is a non-profit civil society organization that works for the conservation of the natural and cultural heritage of Mexico and created a decade and a half ago as a response to the environmental and cultural problems generated by the accelerated urban and tourist development registered in the state of Quintana Roo in the last decades. It works in partnership with different social actions interested in the welfare of our environment and our community, in order to join efforts to achieve collective benefits.